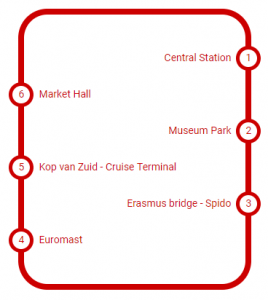 Spot the highlights of Rotterdam with City Sightseeing Rotterdam, a sightseeing tour you’re in control of! Get in the Hop-On Hop-Off bus and discover Rotterdam in a stylish way. The bus will pass all highlights and important places of interest of Rotterdam. During this tour, you will get information about all highlights of Rotterdam. With the Hop-On Hop-Off bus, you’ll drive along the best and most important sightseeing spots op Rotterdam. City Sightseeing Rotterdam will pass the impressive Market Hall, the spectacular cube houses, the impressive new Central Railway Station and the Euromast. Hop-On Hop-Off Rotterdam likes to get you to know the city. Hop on board of the world famous red City Sightseeing-busses and experience a panoramic view of the biggest architectural city of the Netherlands. With 6 favourable bus stops, Hop-On Hop-Off takes you to all essential sightseeing spots of Rotterdam. Hop on and Hop off and explore the city at your own speed. From 23 February 2019 the Hop-On Hop Off season starts. Check the online booking system for the current operating hours or download the app! The first buses leave at 10:30 a.m. from stop 1 and from stop 4. The last buses leave at 16:30 p.m. from stop 1 and from stop 4. We ask you to download the app, so you will have the current information about the live location of the buses and the days of the tours.